The brick facade is a century old, but the burning, spinning and capturing of heat inside the University of Minnesota's new Main Energy Plant is the wave of the future. 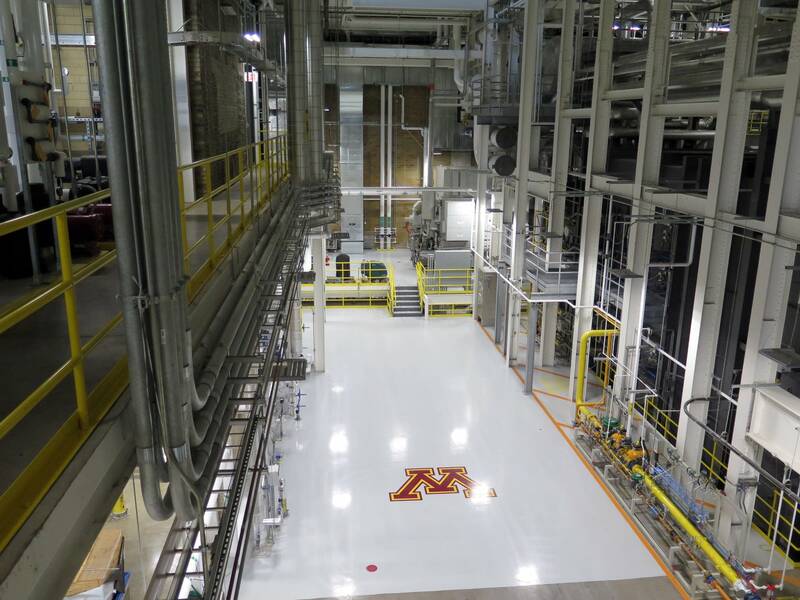 The plant, located on the banks of the Mississippi River near Dinkytown, came online last month and will save the university about $2 million a year in utility costs. 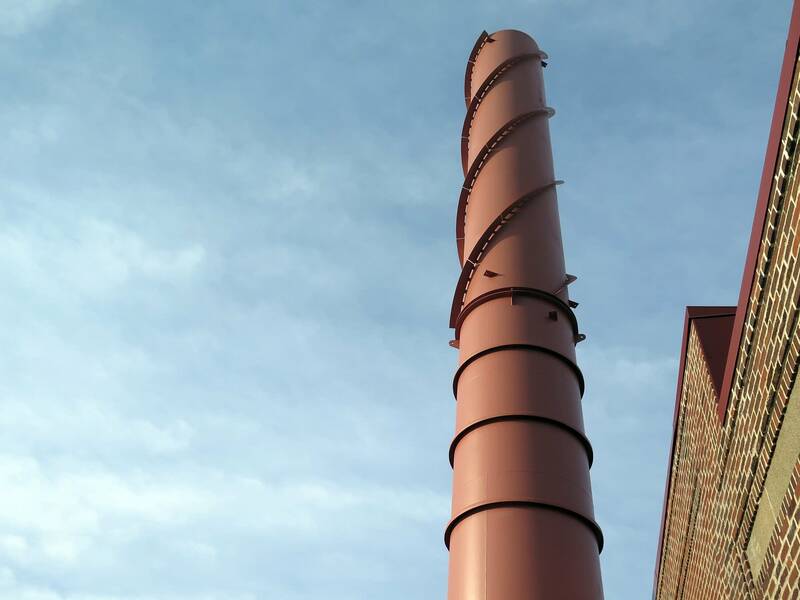 This efficient facility is a combined heat and power plant, meaning the heat that's generated from making power — up to 22 megawatts — is captured and used to make steam, which heats a hospital, lecture halls and sports arenas throughout campus. It all starts with a natural gas or fuel-powered jet engine. Hot air coming off the engine spins a turbine that generates electricity. 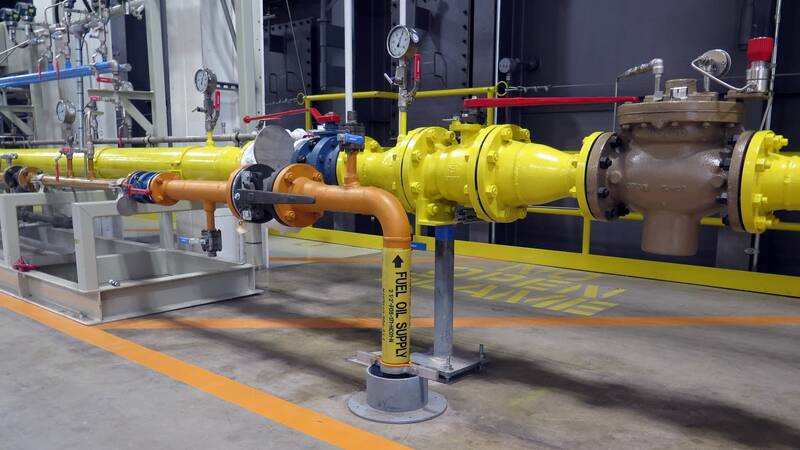 "All that hot air coming off the jet engine then goes into this large gray box," said Jerome Malmquist, the university's energy management director during a tour this week. "This large gray box is like a great big tea kettle. We're not making tea, we're making hot water or steam." It's hard to visualize because all the burning, spinning and moving steam around is happening inside giant enclosures and pipes throughout the plant. The steam travels through miles of pipes inside tunnels that are 90 feet underground. 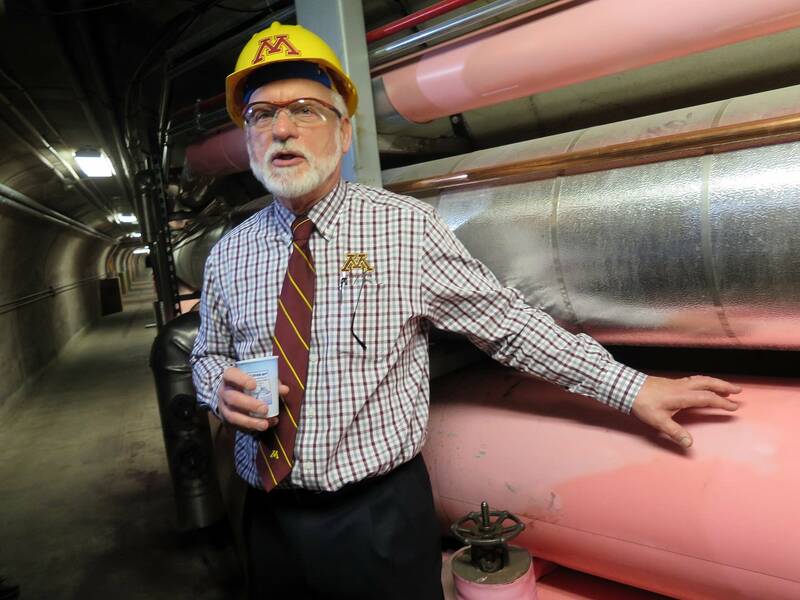 Steam shoots through fat pipes — sometimes as much as 550,000 to 600,000 pounds per hour, Malmquist said. Most of the steam makes its way back to the plant as hot water, where it's used again to make more steam. All of this capturing and reusing of heat makes the plant 83 percent efficient. "We're very proud of that," Malmquist said, noting that most standalone power plants are less than half as efficient, meaning there's a lot of heat that goes to waste. "It's a little-known fact that in generating power in the United States, two-thirds of the energy is thrown away. Kind of like buying a six-pack of beer and pouring four of them out," said Mark Spurr, an energy consultant with FVB Energy. FVB studied combined heat and power in Minnesota a few years ago and recommended doubling the technology's capacity in the state by 2030. Minnesota has more than 50 combined heat and power facilities of all different types, according to the Department of Energy, but most of them are small. Spurr said the technology can go into new plants or be part of retrofits in existing plants. "It's not an unknown technology. It's just that there's so much more potential," he said. But there are several barriers. There's no one-size-fits-all solution for a given site because everybody has different needs for power and heat. Financing is also a challenge, and historically utilities have not wanted universities, cities and others to generate their own power. Malmquist said the University of Minnesota worked with Xcel Energy on a plan that would address both parties' needs. The university wanted the plant because it could both save money on utilities and make the campus more resilient to power outages. 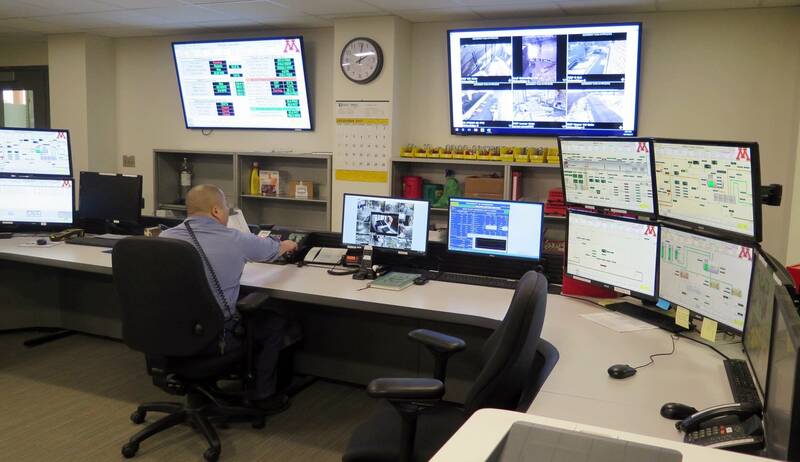 The plant doesn't produce enough electricity to keep everything running during the case of an outage, but priority power uses such as hospitals and sensitive research would receive uninterrupted service. Capturing the heat means the technology also reduces carbon emissions — the university expects its carbon footprint to go down by 10 to 13 percent. But many combined heat and power systems still rely on burning fossil fuels, so some question their ability to make a big enough dent in emissions causing climate change. For example, student and faculty protests halted a similar project at Duke University earlier this year. In Minnesota, clean energy advocates have been supportive of combined heat and power. "Minnesota should invest in least-cost renewables and maximize that in our state," said Will Nissen, director of energy performance at Fresh Energy. "Where projects are feasible and the sites make sense, combined heat and power projects should move forward." There's a big combined heat and power plant going in next year at Flint Hills Resources — the oil refinery in Rosemount, Minn. But even with that addition, the capacity of combined heat and power plants in Minnesota will be less than half what the state's largest coal-fired power plant — Sherco in Sherburne County — can produce.